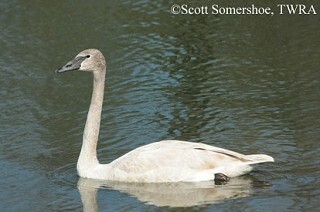 The Trumpeter Swan is the largest waterfowl species in North America. It was once abundant and ranged across the northern prairies of North America, but was nearly driven to extinction by the end of the 19th century due to unregulated hunting and the millinery trade (swan feathers were popular in lady's hats and made the best quill pens). Due to intensive reintroduction efforts in the Midwest, the species is making a comeback. John James Audubon himself reported the first Trumpeter Swans in Tennessee in November 1820. The species was not seen again in the state until December 2001 when a family of two adults and an immature were found in Lauderdale County. Unfortunately, two of these birds were mistaken for Snow Geese and shot. Additional sights, mostly from the western part of Tennessee, were confirmed in 2003, 2004, 2009, and 2010 from Dyer, Lake, Madison, Sullivan, and Washington Counties, from late December through early March. Though still a very rare bird in Tennessee, as the eastern population continues to increase, additional sightings are expected. It is illegal to hunt any species of swan in Tennessee. Description: This pure white swan has a long, straight neck, and a long, straight, flat, black bill. Males and females look alike. Immature birds (August - December) are dirty white overall; legs gray-pink, turning yellowish gray to dull black, and bill gray-black at base, pink towards tip, turning completely black over time. Voice: The name of this swan comes from its deep trumpeting call. Mute Swans have a curved neck, and an orange bill. They were introduced from Europe, are uncommon in Tennessee, but generally occur on farm ponds rather than large bodies of water. Snow Geese are smaller, and have black wing-tips, shorter necks, and a pink bill. Habitat: Winters in lakes, streams, springs, rivers, and reservoirs. Diet: Aquatic plants, seeds, tubers, grains, some mollusks and arthropods. 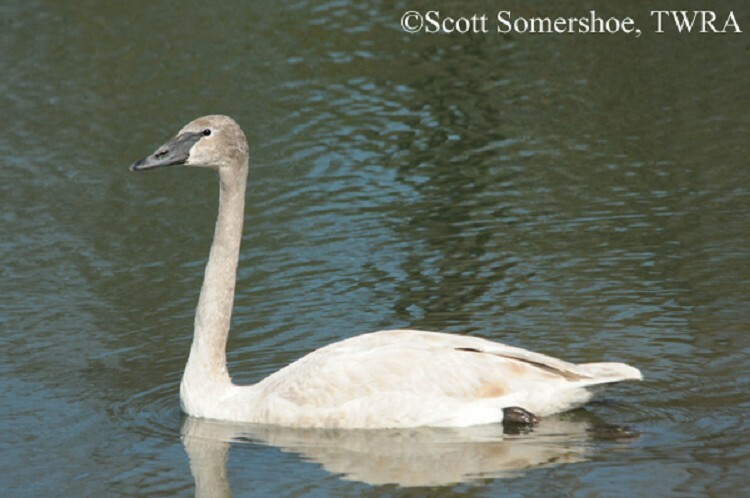 Nesting and reproduction: The Trumpeter Swan has never been known to nest in Tennessee. Status in Tennessee: Trumpeter Swans are extremely rare in Tennessee, but there have been several records in the past 10 years. In the winter of 2010 there were 3 occurrences in Tennessee: 3 birds in Dyer and Lake Counties, and 1 immature in Madison County. Recent records have been from late December through early March. It is illegal to hunt any species of swan in Tennessee. There are now three separate populations of Trumpeter Swans; the Pacific Coast Population breeding in Alaska and western Canada; the Rocky Mountain Population wintering primarily in the Red Rock Lakes National Wildlife Refuge; and the Interior Population, which includes all Trumpeter Swans breeding east of the Rocky Mountains. It is this population that is the product of intensive reintroduction efforts, and the source of any Trumpeter Swans found in Tennessee. Restoration efforts have suffered numerous setbacks including lead poisoning, power line collisions, and illegal shooting. In Tennessee, Trumpeter Swans were illegally shot in 2002 (2 of the 3 birds that arrived in December 2001), and one immature was poached in 2010. All supposedly misidentified as Snow Geese.The TWRA waterfowl guide now features a page called "Don't Shoot Unless You're Sure" featuring Trumpeter and Tundra Goose descriptions. It is illegal to hunt any species of swan in Tennessee. The oldest known Trumpeter Swan was 23 years 10 months old. Best places to see in Tennessee: Tundra Swans are rare throughout Tennessee. Lauderdale Waterfowl Refuge may be the best location in West Tennessee for winter Tundra Swans. Mitchell, Carl D. and Michael W. Eichholz. 2010. Trumpeter Swan (Cygnus buccinator), The Birds of North America No. 105 (A. Poole and F. Gill, eds.). The Academy of Natural Sciences, Philadelphia, PA, and The American Ornithologists' Union, Washington, D.C.